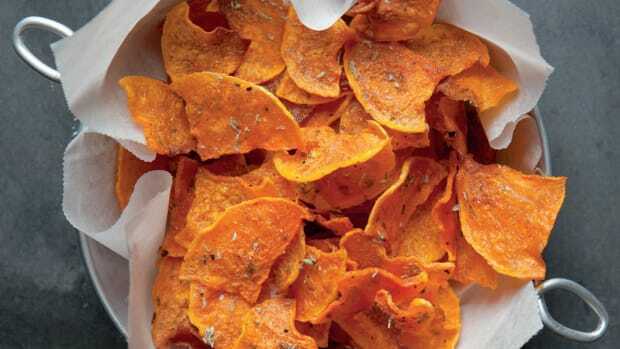 Vegetables taste better when they’re crispy, and bags of veggie chips have been popping up on grocery stores all over the nation: sweet potato chips, green bean chips, parsnip chips, taro chips and more. However, these commercially produced crisps are usually loaded with salt and preservatives and retain very little of the nutritional value that vegetables are known for. 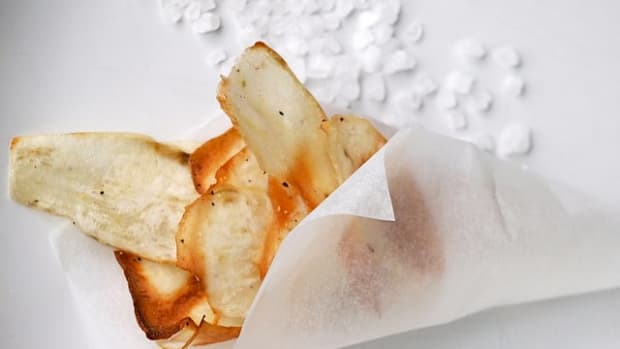 Make your own veggie chips and you can control the salt, oil and method of cooking. 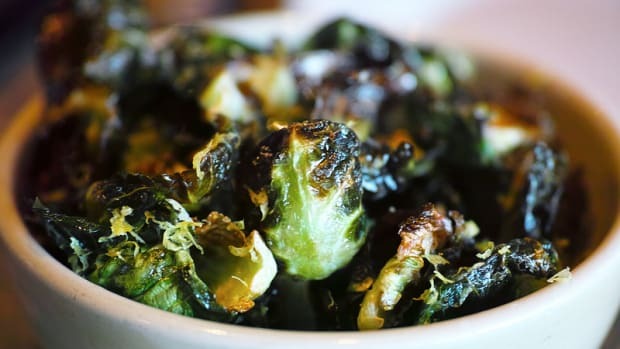 Try the following recipes for crispy, crunchy baked vegetable treats that the whole family will love. 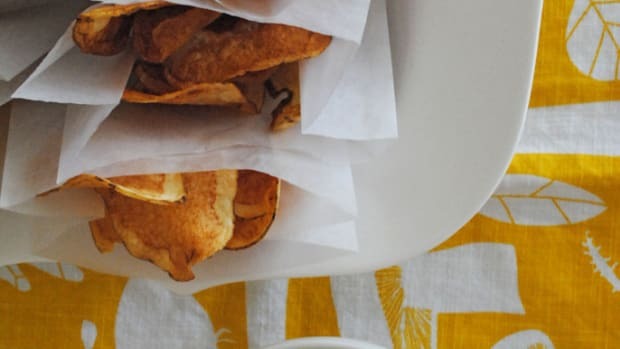 The standard vegetable chips, potato chips have a long and beloved history on the American table, next to hamburgers, onion dip and deli sandwiches. 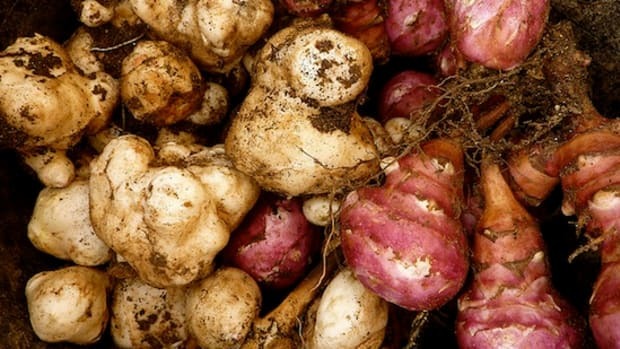 Make your own by starting with any variety of potatoes, such as Yukon Gold or Red Fingerling. Scrub them clean, leaving the peeling on, and then slice them as thin as possible – making sure all the slices are about the same thickness. Rinse and soak the slices in water for one hour, then dry thoroughly. 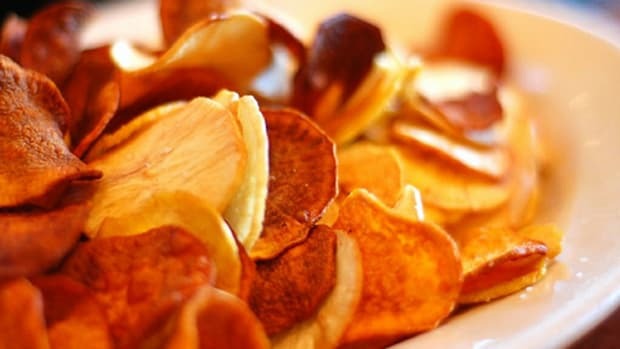 Traditionally, potato chips are fried in vegetable oil, but you can bake them for a healthier version. Simply toss the slices in 1 tablespoon vegetable oil per potato, sprinkle with salt and pepper and then bake at 400 degrees until golden brown, about 15 minutes. This recipe also works well with sweet potatoes; try them with a mix of chili powder and cumin for a spicy treat. The pretty fuchsia pink of fresh beets turns a rich purple when they are baked into crispy chips. Cut two large beats into slices that are 1/8” thick, then place on a greased baking sheet. 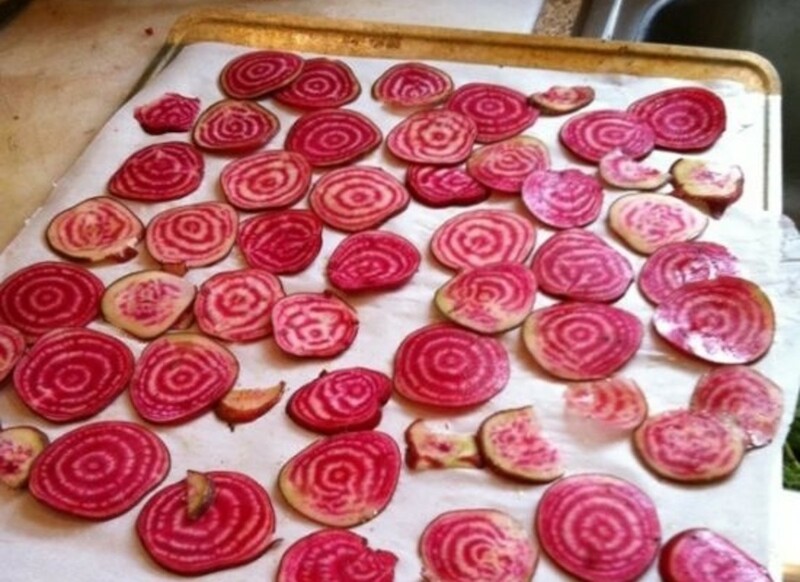 Brush the beets with a light coating of olive oil, and then bake at 325 degrees for about 45 minutes. Crunchy carrots get their flavors popped when baked into crispy orange treats. Slice two large carrots as thinly as possible, then place into a bag or bowl and toss with 2 tablespoons of olive oil and a good sprinkle of sea salt. Arrange slices in one layer on a greased baking sheet and cook for about 35 minutes at 275 degrees, checking often towards the end to make sure that nothing burns! Haven’t you heard? Kale is the new beef. Try yours in crispy chip form and discover a whole new world. First, find a nice fresh batch of kale, and then wash and dry it thoroughly. Remove the leaves from the tough steams, tearing them into bite-size pieces. In a large bowl, add the kale leaves plus 3 cloves of finely minced garlic and 2 tablespoons of olive oil. 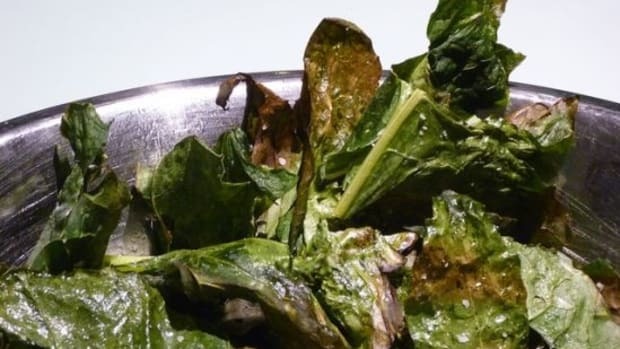 Toss to coat all the leaves thoroughly, and then place the kale in a single layer on a greased baking sheet. Bake for 30 minutes at 275 degrees, until the leaves are brittle and crispy to the touch. 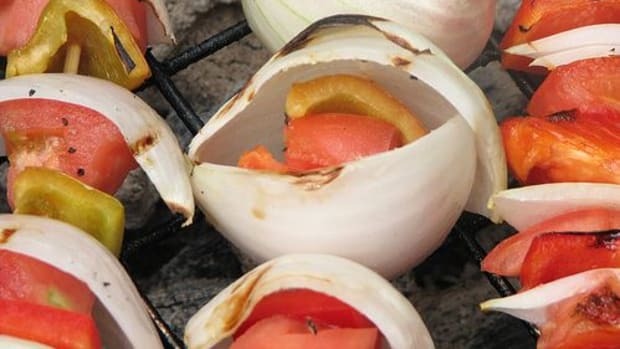 Add salt and pepper to taste if you would like. Green beans make long, crispy treats when you bake them – so much fun to eat! First wash and prepare your green beans by snapping off both ends, then dry them all well. Spread them on a greased baking sheet and drizzle with 1 tablespoon of olive oil for each cup of beans. Sprinkle with salt and pepper, then cook for 30 minutes at 400 degrees, stirring every ten minutes until crispy.